Truly Polished: Nails by Topshop Gypsy Night - Slightly Pic Heavy!!! Nails by Topshop Gypsy Night - Slightly Pic Heavy!!! I've got a Topshop nail polish to show you today. I am a huge fan of Topshop's clothes and I do shop there a lot, but this is actually my first nail polish from them. I'm usually quite wary of clothes shop cosmetic ranges because I think brands should stick to what they know and on Topshop's case that is clothes. However, I think I may have to take that back after Gypsy Night! I read about this polish a while ago and needed it straight away so I bought it online with a couple of things. Gypsy Night is a black jelly polish with a lot of gold microglitter, small holographic glitter and copper/green colour shift flakies. 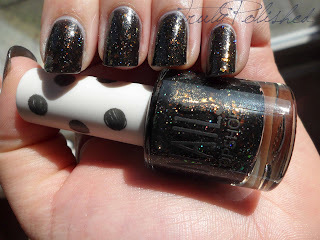 All my photos show two coats of Gypsy Night with a coat of Seche Vite. I got a little bit of shrinkage with this, sorry! First I planned on using my Nº7 top coat so I didn't wrap my tips, then I couldn't find it and had to get the Seche Vite on ASAP while the polish was still wet so it didn't crinkle up! So massive apologies for that! My camera did NOT want to focus on this! All the different types of glitter was throwing it off! This means of course that I had to take a few pictures! Click "read more" to see the all of the photos and the rest of my review. The flakies in this are so glowy! 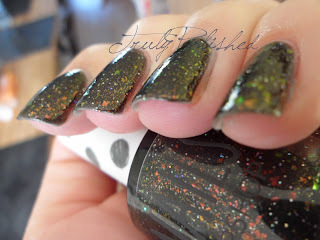 I had to get a real macro of this, the flakies look like shards of glass! All in all I really like this polish. The formula was great, two coats went on perfectly and drying time was very quick with Seche Vite. Removal was good too, no staining at all which I LOVE in a black polish. 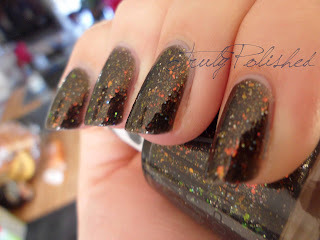 I love flakie nail polishes, they look so unusual and they're still not all over the place which I like! However, I eagerly await the day when I see a different colour shift... I think copper/gold/green has been done to death now! Colour-wise I do think that the gold microglitter can make this black look a bit brown at times. Some people might not mind this, but it's my only criticism of this polish. I'd give up some of the glitter for it to look a bit darker in the shade! In the sun it looks really dark though, which is so pretty that I think Topshop can be forgiven! This is the third time I've worn this polish and I really like it. It's a good alternative to a black if you want something a bit different, which I often do. You can buy Gypsy Night here for £6. It is available in stores but I find Topshop stores a bit hit and miss when it comes to finding nail polish. Some stores stock lots of colours and some (my local store) stocks ten at the very most! I'd definitely get out and buy this if I were you, and keep your eye out for other Nails by Topshop colours. I've got my eye on a few more to buy! So pretty! u pick the best polishes! By the way, have you received your swap package yet? Im going to be nervous until it arrives. Glad you like it! I'm not sure because I'm out of the country until tomorrow evening. I'd ask my Mum to check at my house but I'm expecting all sorts at home! So I'll let you know ASAP! Have you received yours? I sent another one with yours to Seattle and she got it two days ago. Yes I received mine! Thank you so much! I couldn't believe how fast it arrived & i'm tickled to death!! Thanks for everything!! I look forward to swapping in the future. Don't hesitate to contact me if you need me to go on a hunt for a polish for u in the future. It's been a pleasure. Ah I'm so glad! That means both of the packages I sent arrived safely! I still couple more to send so I'm feeling more confident about them! I might have to revisit the Revlon whimsical nail polish in a little while if you still have any left, I have bought so much polish recently so I'll have to wait for a bit! No problem at all. I can always go pick up Whimsical for you. I see it EVERYWHERE here lol.